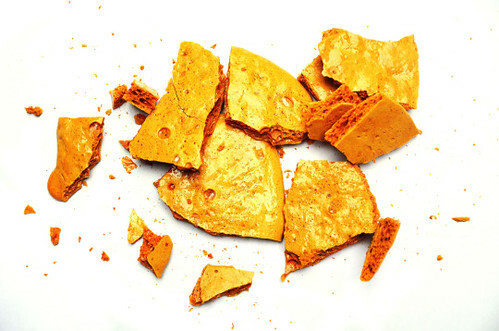 EAT: Honeycomb (Cinder Toffee). / papillon. So arguably I’ve been on an extended sugar high for a couple of days, but: YOOOOO. Did you know that you can make super fast and super easy honeycomb out of stuff you’ve got in your cupboard? I am simultaneously hyperactive and delighted. 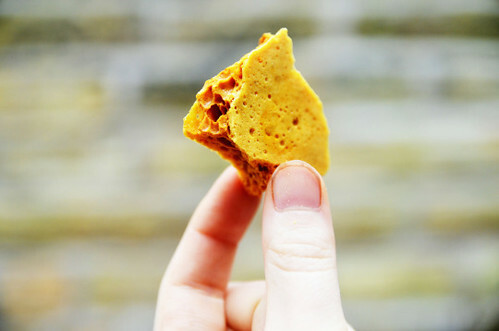 This is also known as cinder toffee, and it’s sweet and smoky and crunchy. You could coat it in chocolate, and I’d probably like you. You could also totally wait to see the recipe I’m going to post tomorrow, and shatter it like splintered gold over the top. Yoooo. Line a baking tray with a baking sheet or foil. In a deep saucepan, combine the sugar and syrup and dissolve over a medium-low heat. Increase the heat and bring to the boil - don’t stir, but you can swirl the pan occasionally to stop the sugar burning. Once it’s a nice amber colour, take off the heat and sprinkle in the bicarbonate of soda, working quickly - it’ll foam up and go paler and you’ll feel like a master scientist. Give it a quick whisk through, and pour over the baking sheet - don’t spread it out, just let it stand undisturbed for 20 minutes or so until it’s hardened. Bash it to break it up into pieces to eat.